Suitable for all types of cooking equipment over wall and island arrangements. On the three sides (wall type) and 4 sides (island type) air is discharged into the canopy via Jet Stream slots for a capture air stream effect. 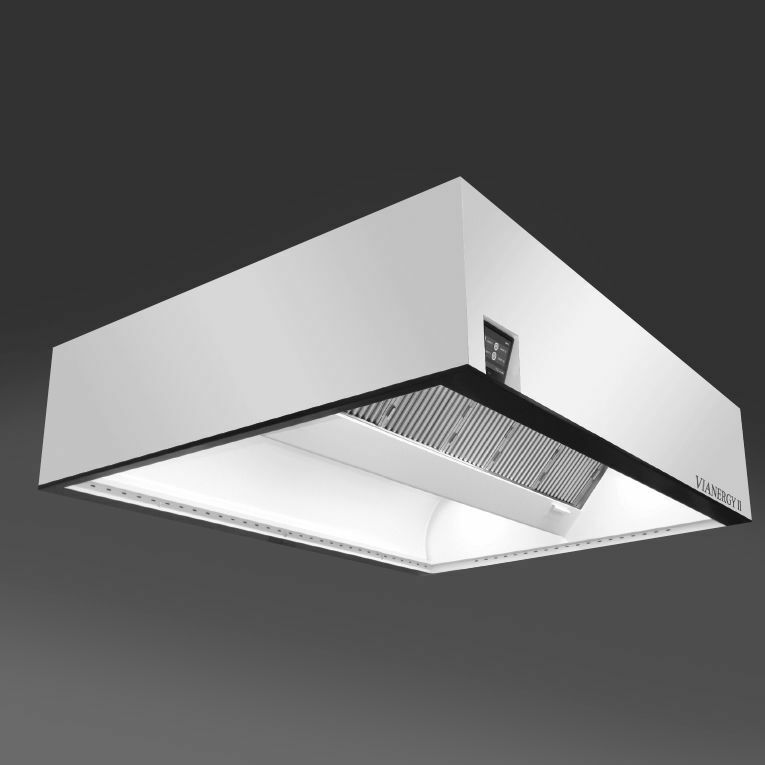 This system creates a complete envelope around the cooking apparatus reducing spillage of exhaust. A significant improvement of the capture and containment performance of the Vianergy II canopy is obtained due to the modification in the curved structure on the internal side of the front of the canopy. The curved structure ends with a specially designed (and patented) lip, angled upward to turn the deflected air back to the filter. On the bottom channel is a horizontal supply air slot, capture air principle, that blows air into the canopy with a velocity of 2m sec. capturing the deflected airflow and lifts it back to the filter bank. The Jet Stream supply has a maximum of 10% of the exhaust volume. This avoids spillage of fumes and contaminants back into the kitchen. A significant energy saving is achieved due to this new, patented construction, tested by TNO, the Netherlands, conform ASTM F1704 method. Download our brochure form more information.